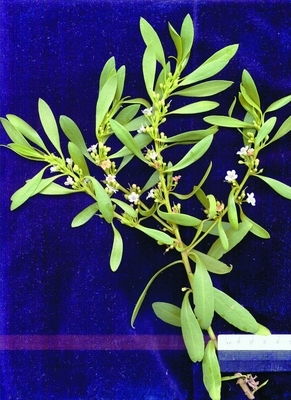 Small, 5-petalled flowers, white spotted with purple, 7mm wide and occurring in the leaf axils. Produces purple to black succulent fruits about 8mm wide. Tall woody shrub or small tree. Leaves thick, elliptical and pointed, slightly toothed towards tips, 3-9cm long. Propagate from fresh seed or cuttings. Suitable as a hedge or screening plant, especially in sandy soil and other well-drained positions, resistant to salt spray. Tolerates salt winds and dry conditions. The fruits are salty-sweet and edible. Not suitable below powerlines. Difficult to grow from seed. Use fresh seed, cover with 2-3mm of seed raising mix and place 4mm of gravel over surface. Place the trays in an open position and provide shade on hot days. Remove flesh from fruit and soak overnight in warm water before sowing. Cuttings are easy to strike, and usually take within a fortnight. Can be struck in a glass jar of water, placed in a well-lit position. Change the water once a week. Take care when potting out, as formed roots tend to be soft. Keep the potted plants in the shade for 3-4 weeks before planting out.